This title offers tried and tested, easy-to-use material, building on characters from the previous book. It includes 20 collective worship outlines grouped to cover a wide range of topical themes, including moral issues, citizenship and seasons of the Christian year. The material is organised according to suitability into KS1, KS2, and whole school assemblies. It includes a practical introduction written from the author's experience of leading collective worship in schools and development of different storytelling techniques. It is also suitable for teachers in primary education, especially those newly-qualified, and anyone leading collective worship in schools, as well as the clergy and children's work leaders. It is also suitable for purchasers of "Collective Worship Unwrapped" and "Stories for Interactive Assemblies", and more. 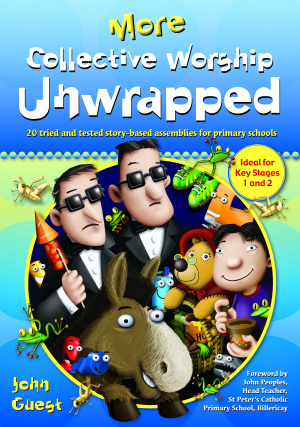 "Collective Worship Unwrapped" is a flexible and practical resource, ideal for teachers, RE coordinators and those invited into schools to lead collective worship.The resource provides 20 easy-to-use collective worship outlines that can be set in the context of a variety of topical themes, including moral and personal development, citizenship, spiritual values, seasons of the Christian year, and special times. The book uses familiar characters well-loved in "Collective Worship Unwrapped". The assemblies are grouped according to age: KS1, KS2 and whole school. More Collective Worship Unwrapped by John Guest was published by Barnabas in January 2010 and is our 20720th best seller. The ISBN for More Collective Worship Unwrapped is 9781841016641. Anyone who has had to stand up in front of row upon row of children in a school assembly will know how important it is to grab their attention straight away and sustain their interest throughout, for the alternative is a very public struggle! John Guest offers practical guidance at the beginning of this book to help get it right. He discusses the importance of evoking the senses, the art of storytelling and the elements of a good assembly offering wise insights from his experience and knowledge of schools. The book includes music for related songs and photocopiable images to assist the storytelling; the assemblies are sectioned into the two key stages whilst including some suitable for the whole school as well. The characters from the Toolshed Gang and the Two Johns offer some continuity between the different assemblies as the children become familiar with them. As a resource this book is easily accessible, it clearly identifies the main theme, related bible links and songs, a story text and additional resources needed. Particularly helpful is the ‘follow-up’ box that acknowledges the issues and emotions some themes begin to unlock and suggests relevant activities that could be used within the smaller setting of the classroom. The fun and energy that this book exudes will inspire, motivate and help build up the confidence of anyone facing a hall full of children! Got a question? No problem! Just click here to ask us about More Collective Worship Unwrapped.